HAV-304 Airlander has no internal structure. It maintains its shape due to the pressure stabilisation of the helium inside the hull, and the strong Vectran material skin. It also pushed Antonov AN225 to the second place as the longest aircraft in the world with 302feet long, nearly 30 feet longer than AN225. 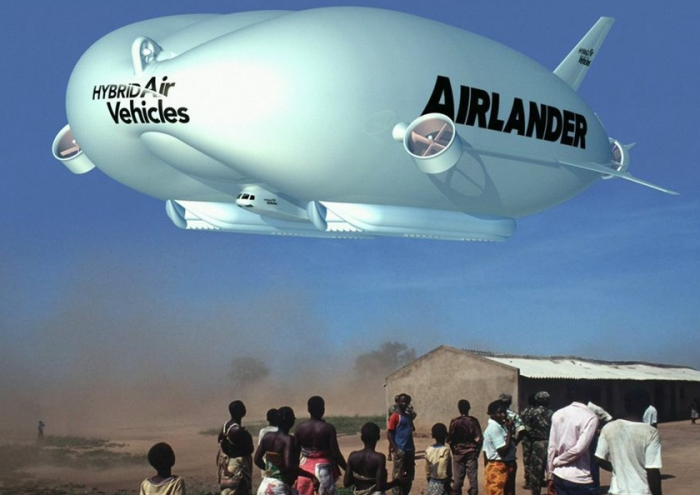 The Airlander is a combination of helicopter, airplane and airship and designed to takeoff and land vertically. HAV has four turbocharged, V8 diesel engines that power the propellers and reach speeds up to 100 mph. does not require runway to takeoff. Profiled pneumatic tubes / skids on the underside of the two outer hulls provide for multi-surface ground operation including amphibious capability. Skids are ‘sucked-in’ for a clean-in-flight profile.  Large transparencies for excellent all-round visibility. It is mainly used for ferrying humanitarian aid around the world.